About two weeks ago, we reviewed the GEX Roka Boy Compact after a reader wrote to us about reviewing an air-powered filter. 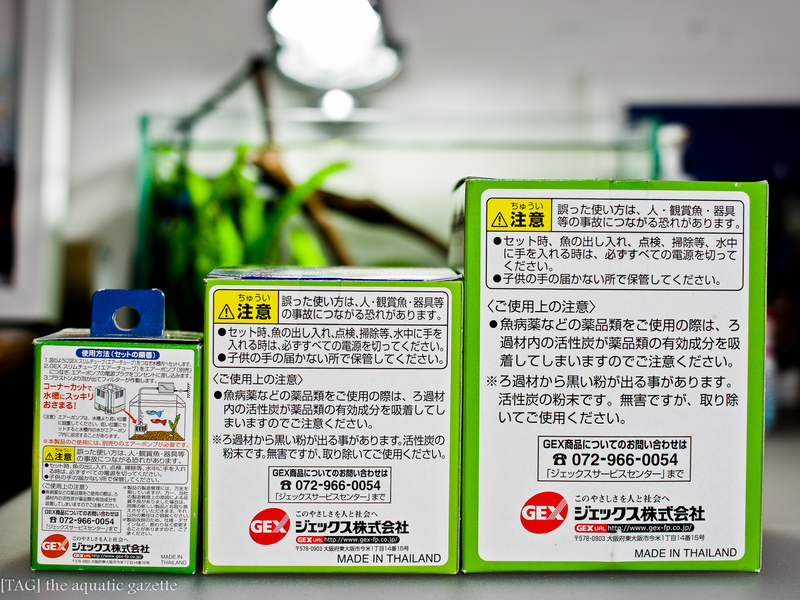 We were pretty impressed by the Gex Roka Boy Compact which was a great filter designed into a very small package, and decided to bring in the Gex Roka Boy S and Gex Roka Boy M and do a comparison of all three. 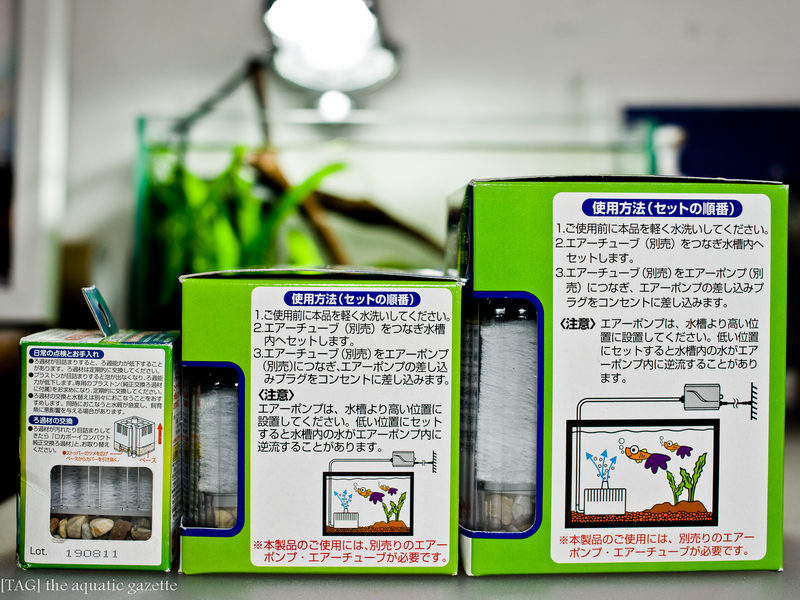 The boxes of the S & M spots the same appealing design that is usually typical of Japanese aquarium companies. 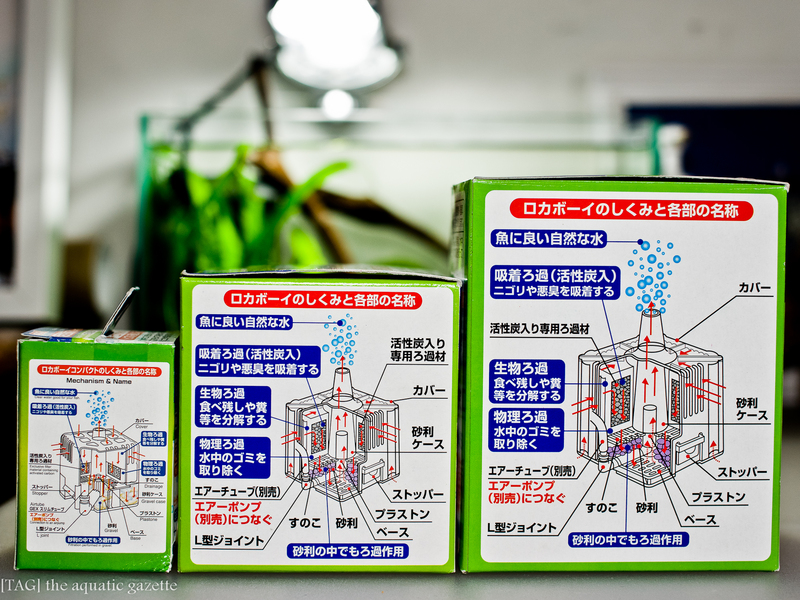 The diagrams on the boxes clearly illustrates the filter that you will be purchasing and the functions that it performs. However, the S & M do not carry any English translation for their diagrams while the Compact does. We found that puzzling as the lack of space cannot be an issue when the Compact manages to squeeze these translations in. One reason for this lack may be because the S & M were not meant for our local market but for the Japanese market instead. 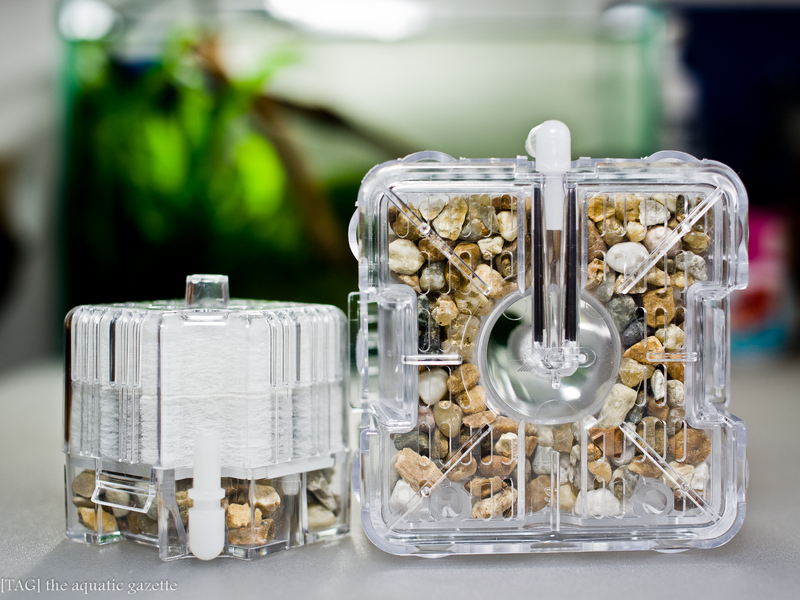 Unlike the Compact, the S & M does not come with a separate biological sponge. 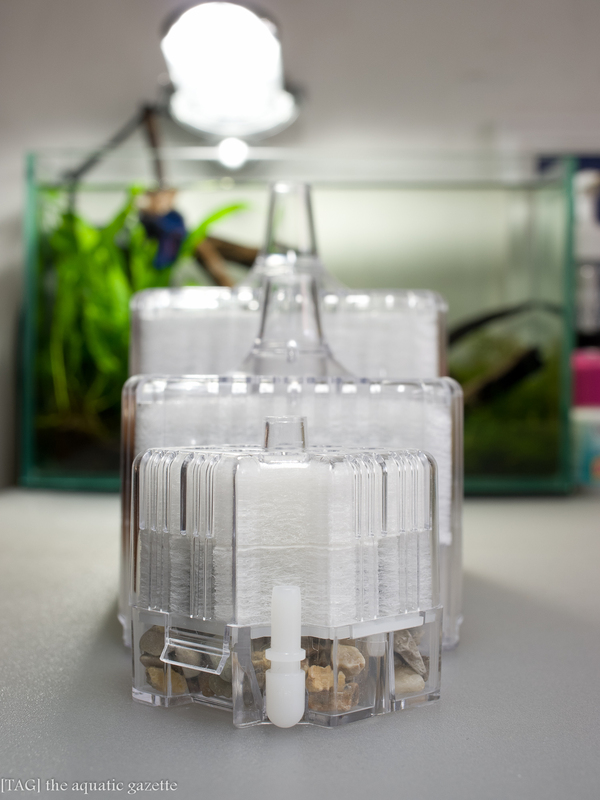 Instead, their biological sponge is packed with activated carbon and it will require replacing every month or so to ensure optimal chemical filtration effectiveness. Frequently changing the biological sponge just to ensure chemical filtration effectiveness does present its own problem. 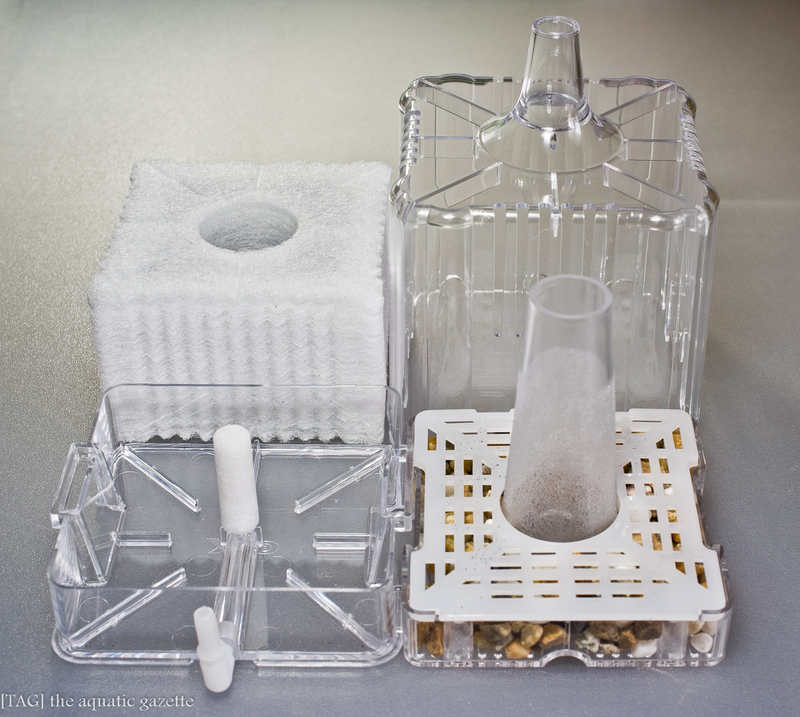 The new biological sponge will have to start the colonization of beneficial bacteria all over again and this will affect total filtration effectiveness. 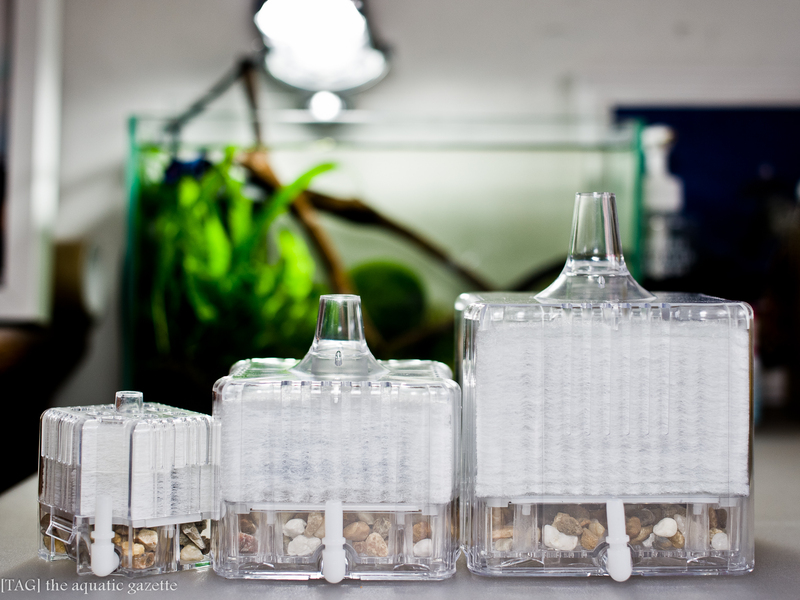 When we used the S for one of our aquariums, we prefer to let the activated carbon run its course and then to depend on the biological sponge for the long run. 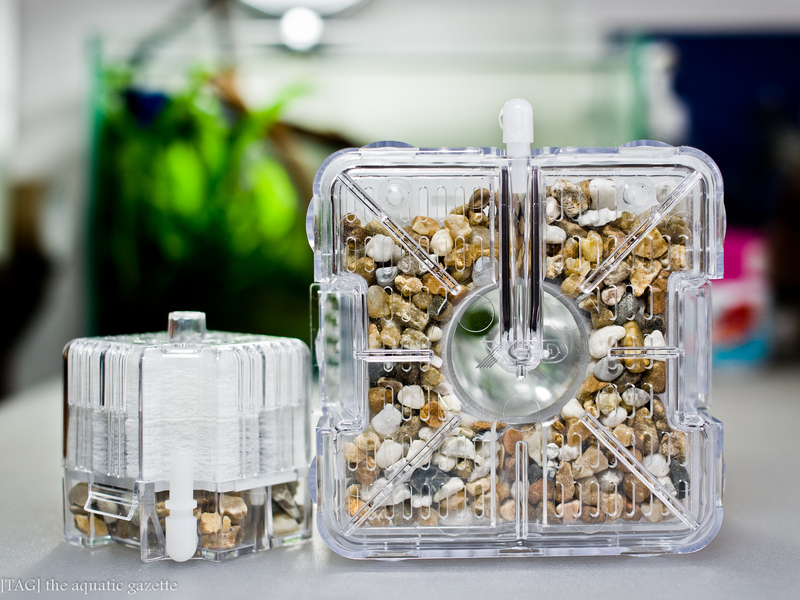 The S & M are made of the same good quality plastic that the Compact is made of. The plastics are solid and clear, machined properly, with the different parts fitting nicely. 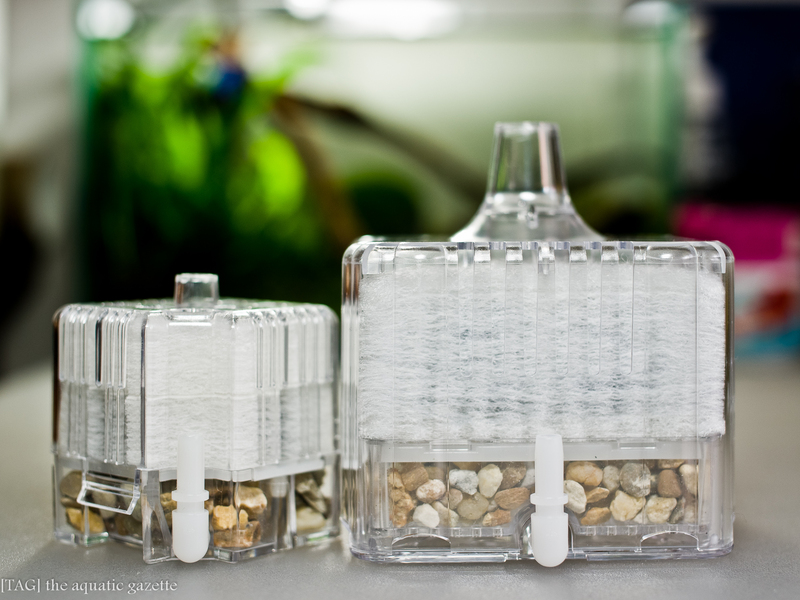 The plastic clamps that hold the filter together are sturdy and we don’t foresee any problems with them breaking as sometimes seen in other such filters. Unlike the Compact which is made out of three parts, the S & M are made out of four parts and we are glad for it. 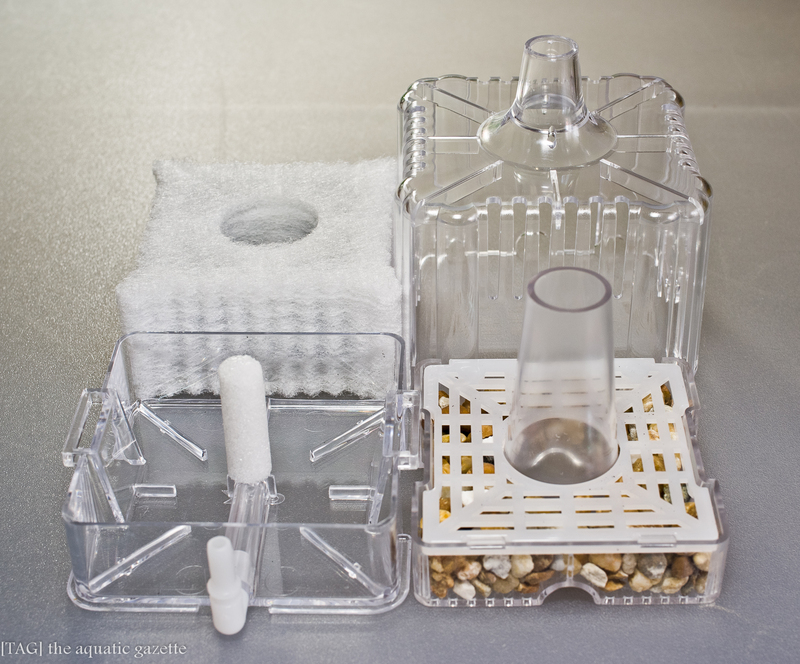 As seen below, the filters can be dismantled quite throughly and this makes for easy washing and maintenance. The M is quite a beast beside the Compact. We didn’t managed to get a GEX Roka Boy L, but we can imagine that it will be much bigger and more impressive in size difference. Here is the M beside the Compact. 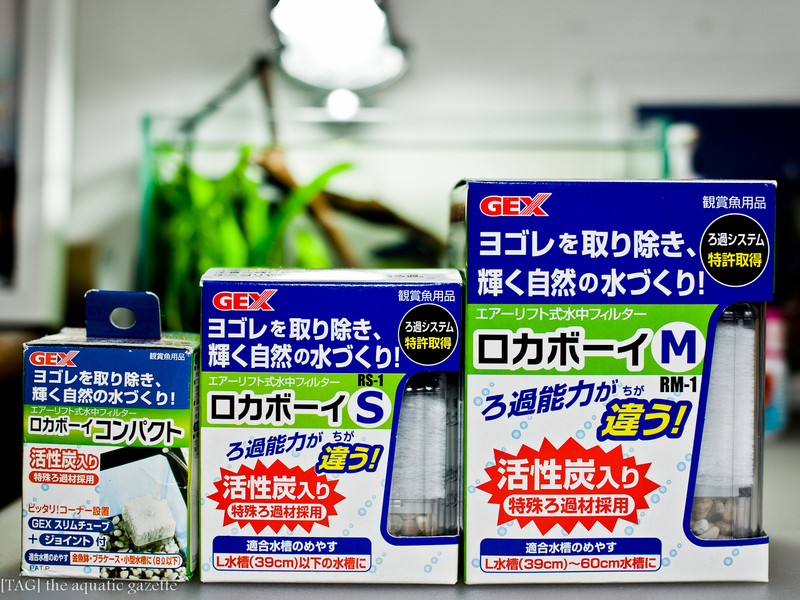 The GEX Roka Boy S & M are similar to the GEX Roka Boy Compact and we have no doubts that they will make good air-powered filters. The only disappointment is that there is no way to change the activated carbon in the S & M filters without throwing out the biological sponge as well. If GEX could split the sponges like in the Compact, that would be great. Hi. 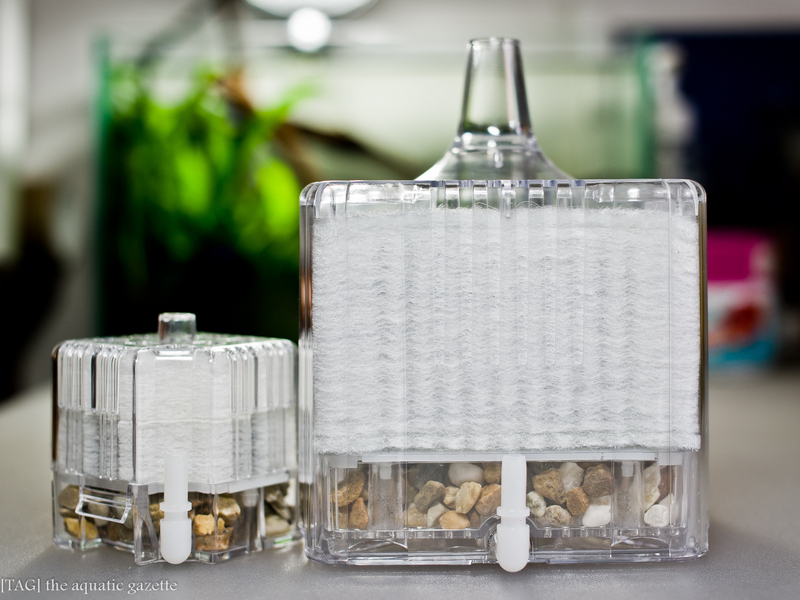 Can the Gex compact filter be found in Singapore? Where can I get it? 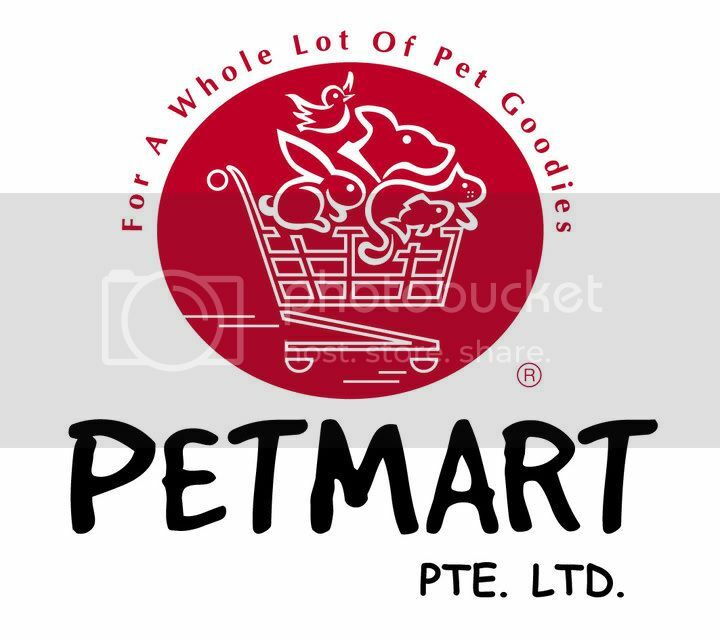 You can get it at Petmart. Serangoon North. [TAG] owes it to our partners for the ability to review products, write articles and keep this gazette going. We would greatly appreciate it if you pay them a visit to show your support for their kindness. Get freshly pressed articles sent straight to your mailbox! Please provide your email address in the box provided. [TAG] The Aquatic Gazette by The Aquatic Gazette is licensed under a Creative Commons Attribution-NonCommercial-NoDerivs 3.0 Unported License. 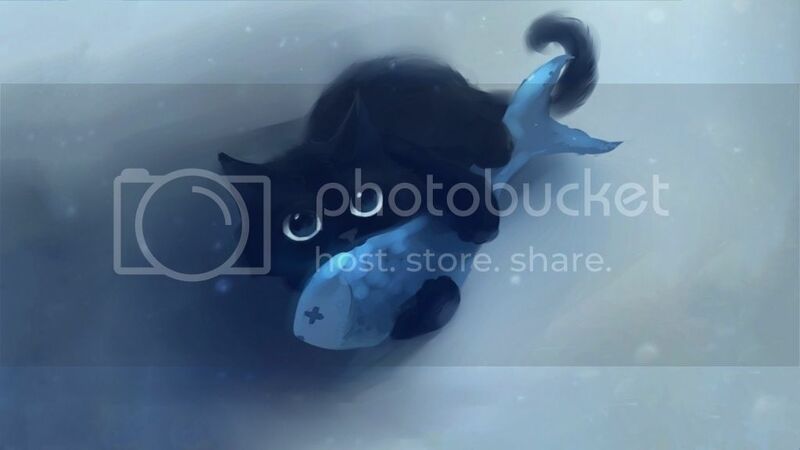 Based on a work at www.theaquaticgazette.com. Permissions beyond the scope of this license may be available at isaac@theaquaticgazette.com.